A�gift for a little prince or a princess. Just Hoppin Around Baby Hamper. You just can't get anything any cuter than the Just Hoppin Around Baby Hamper. Present your favorite Little Prince or Princess with the gift of frogs! This fabric lined baby storage hamper delivers everything you need to care for baby as well as keepsake gifts to keep forever. The ultra soft plush baby security blanker doubles as a rattle. Stop shoppin' around and send the Just Hoppin' Around Baby Hamper, available in two sizes! Medium Includes: Fabric Lined Baby Storage Hamper, Baby Manicure Set, Baby Door Pillow, Johnson & Johnson Baby Soap, Set of 6 Terry Cloth Wash Cloths, Baby Beanie, 100% Cotton Tee Shirts, 5x7 Baby Picture Frame (holds a 3x5 photo), Baby Brush & Comb Set, Baby's First Tooth Keepsake Box, Baby's First Haircut Keepsake Box, Ultra Soft Plush Baby Security Blanket with Frog Plush, Embroidered with "Little Prince" or "Little Princess", Ultra Soft Plush Frog Rattle Ring, 6" Baby Buddy Plush Frog (doubles as a rattle, in front of the basket). Large Includes: Fabric Lined Baby Storage Hamper, Baby Manicure Set, Baby Door Pillow, Johnson & Johnson Baby Soap, Set of 6 Terry Cloth Wash Cloths, Baby Beanie, 2 100% Cotton Tee Shirts, 5x7 Baby Picture Frame (holds a 3x5 photo), Baby Brush & Comb Set, Baby's First Tooth Keepsake Box, Baby's First Haircut Keepsake Box, Ultra Soft Plush Baby Security Blanket with Frog Plush. 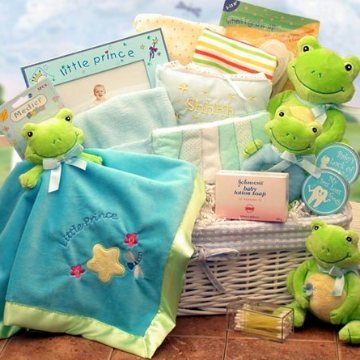 Embroidered with "Little Prince" or "Little Princess", Ultra Soft Plush Frog Rattle Ring, 6", Baby Buddy Plush Frog (doubles as a rattle, in front of the basket), 10" Big Buddy Plush Frog. Medium gift weighs 7 lbs and large weighs 9 lbs.